The Maya sense of time is based on understanding recurrent cycles; this includes the observable motion of the Sun across the sky, the phases of the Moon, the gestational period of human beings, and the growing cycle of corn. 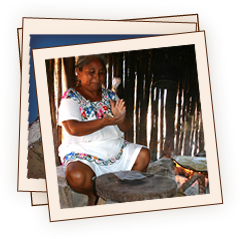 In the highlands of Guatemala, Maya calendar keepers describe time as an attribute of the sacred, and make offerings of corn atole every 260 days to welcome a new cycle of time in the Tzolk’in sacred calendar. Traditional farmers in the Yucatán conduct ceremonies and offerings throughout corn’s growing season, which are in tune with the Haab, their solar calendar. In Maya tradition, time is related to natural cycles of the Earth and the sky. From the Maya perspective, time is sacred and worthy of respect. The offerings and ceremonies that Maya people practice today are rooted in the reciprocal relationship between the Maya and their land. Cultural celebrations surrounding the Day of the Holy Cross and the Day of the Dead have deep connections to ancient Maya knowledge.